Terri here with a quick and easy stamping project....and my first video. I am on YouTube! I posted my first video! 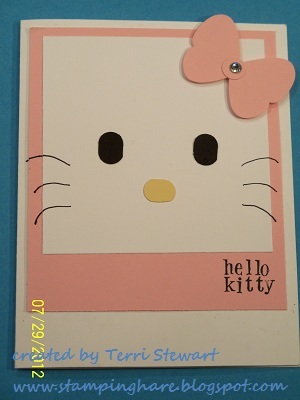 A few weeks ago I saw a Hello Kitty card on Pinterest made by Diane Ouellette and couldn't wait to make it. Because it was so easy to put together I decided to make a video tutorial showing just how easy. I'd love to know what you think of the card and, of course, my very first video!!! Check out my blog www.stampinghare.blogspot.com for more cool projects.